(Nanowerk News) Computation is a ubiquitous concept in physical sciences, biology, and engineering, where it provides many critical capabilities. Historically, there have been ongoing efforts to merge computation with "unusual" matters across many length scales, from microscopic droplets (Science 315, 832, 2007) to DNA nanostructures (Science 335, 831, 2012; Nat. Chem. 9, 1056, 2017) and molecules (Science 266, 1021, 1994; Science 314, 1585, 2006; Nat. 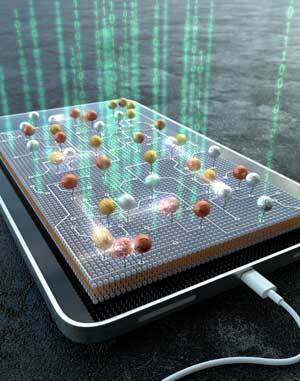 Nanotech. 2, 399, 2007; Nature 375, 368, 2011). However, the implementation of complex computation in particle systems, especially in nanoparticles, remains challenging, despite a wide range of potential applications that would benefit from algorithmically controlling their unique and potentially useful intrinsic features (such as photonic, plasmonic, catalytic, photothermal, optoelectronic, electrical, magnetic and material properties) without human interventions. This challenge is not due to the lack of sophistication in the the current state-of-the-art of stimuli-responsive nanoparticles, many of which can conceptually function as elementary logic gates. This is mostly due to the lack of scalable architectures that would enable systematic integration and wiring of the gates into a large integrated circuit. Previous approaches are limited to (i) demonstrating one simple logic operation per test tube or (ii) relying on complicated enzyme-based molecular circuits in solution. It should be also noted that modular and scalable aspects are key challenges in DNA computing for practical and widespread use. In nature, the cell membrane is analogous to a circuit board, as it organizes a wide range of biological nanostructures (e.g. proteins) as (computational) units and allows them to dynamically interact with each other on the fluidic 2D surface to carry out complex functions as a network and often induce signaling intracellular signaling cascades. For example, the membrane proteins on the membrane take chemical/physical cues as inputs (e.g. binding with chemical agents, mechanical stimuli) and change their conformations and/or dimerize as outputs. Most importantly, such biological "computing" processes occur in a massively parallel fashion. Information processing on living cell membranes is a key to how biological systems adapt to changes in external environments. This manuscript (Science Advances, "Nano-bio-computing lipid nanotablet") reports the development of a nanoparticle-lipid bilayer hybrid-based computing platform termed lipid nanotablet (LNT), in which nanoparticles, each programmed with surface chemical ligands (DNA in this case), are tethered to a supported lipid bilayer to carry out computation. Taking inspirations from parallel computing processes on cellular membranes, we exploited supported lipid bilayers (SLBs)--synthetic mimics for cell surfaces--as chemical circuit boards to construct nanoparticle circuits. This "nano-bio" computing, which occurs at the interface of nanostructures and biomolecules, translates molecular information in solution (input) into dynamic assembly/disassembly of nanoparticles on a lipid bilayer (output). The team introduced two types of nanoparticles to a lipid bilayer that differ in mobility: mobile Nano-Floaters and immobile Nano-Receptors. Due to high mobility, floaters actively interact with receptors across space and time, functioning as active units of computation. The nanoparticles are functionalized with specially designed DNA ligands, and the surface ligands render receptor-floater interactions programmable, thereby transforming a pair of receptor and floater into a logic gate. A nanoparticle logic gate takes DNA strands in solution as inputs and generates nanoparticle assembly or disassembly events as outputs. 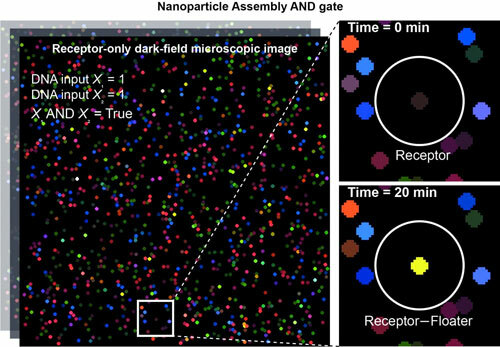 The nanoparticles and their interactions can be imaged and tracked by dark-field microscopy with single-nanoparticle resolution because of strong and stable scattering signals from plasmonic nanoparticles. Using this approach (termed "interface programming"), the researchers first demonstrated that a pair of nanoparticles (that is, two nanoparticles on a lipid bilayer) can carry out AND, OR, INHIBIT logic operations and take multiple inputs (fan-in) and generate multiple outputs (fan-out). Also, multiple logic gates can be modularly wired with AND or OR logic via floaters, as the mobility of floaters enables the information cascade among several nanoparticle logic gates. We termed this strategy "network programming." By combining these two strategies (interfacial and network programming), they were were able to implement complex logic circuits such as multiplexer. The most important contributions of our paper are the conceptual one and the major advances in modular and scalable molecular computing (DNA computing in this case). LNT platform, for the first time, introduces the idea of using lipid bilayer membranes as key components for information processing. As the two-dimensional (2D) fluidic lipid membrane is bio-compatible and chemically modifiable, any nanostructures can be potentially introduced and used as computing units. When tethered to the lipid bilayer "chip", these nanostructures can be visualized and become controllable at the single-particle level; this dimensionality reduction, bringing the nanostructures from freely diffusible solution phase (3D) to fluidic membrane (2D), transforms a collection of nanostructures into a programmable, analyzable reaction network. Moreover, we also developed a digitized imaging method and software for quantitative and massively parallel analysis of interacting nanoparticles. In addition, LNT platform provides many practical merits to current state-of-the-art in molecular computing and nanotechnology. On LNT platforms, a network of nanoparticles (each with unique and beneficial properties) can be design to autonomously respond to molecular information; such capability to algorithmically control nanoparticle networks will be very useful for addressing many challenges with molecular computing and developing new computing platforms.